The Complete Maui Experience! Book with us and receive complimentary discounts to restaurants and activities such as Duke's, Ruth Chris, Hula Grill, Kimo's, snorkel gear, Whale Watching, Snorkel excursions and more!! The Mahana Resort - If you are familiar with West Maui, you will already know The Mahana is truly a premier property with spectacular oceanfront views. Just steps to the sandy Kaanapali beach, you will be led on a two and one half mile stretch of incredible ocean beauty. This AAA Three Diamond resort consists of twin towers containing 215 units on five acres. Designed with a sense of peace and privacy, you are close to championship golf courses, great restaurants and shopping. Ground floor for great convenience, Unit 114 at The Mahana is one bedroom unit has a king-size bed with one bath and the living room has a queen sofa bed. The unit serves four guests very comfortably. The kitchen is fully equipped including refrigerator with ice maker, stove, dishwasher, microwave, toaster, drip coffee maker, blender and all kitchen utensils. Also included for your convenience is salt and pepper, spice rack, plastic wrap, foil, baggies, napkins, paper towels, toilet paper, Kleenex, dish soap, hand soap, dishwasher soap, laundry detergent, starter size shampoo/conditioner and hair blow dryer. All linens are provided including extra bedding and towels. Also available for your use are beach towels and a cooler. The unit has two flat screen televisions with remotes, one in the living room with a DVD player and one in the bedroom. A stereo is provided in the living room with CD player and a docking station. Central air conditioning, washer/dryer, iron and ironing board and extra hangers all make your stay more relaxing. The tiled lanai is spacious with patio table and four chairs. The unit is approximately 1056 square feet and the interior is decorated in Hawaiian motif. Check in 3:00 PM, Check out 11:00 AM. Hawaii State Sales Taxes are additional. Maid Service available at additional cost. GE/TA #211-847-3728-01. Don't like the $500.00 refundable damage deposit? We offer our own damage liability form, just inquire! An important feature Maui Beach Condos offers to their guests is the owners, Ben and Evie Leland live on Island and are there to assist you should you need anything, or if there is any concerns regarding your accommodations. Many owners who rent, live on the mainland which can potentially create problems if there is a need for assistance. We as owners, take great pride in providing you with first class accommodations. Planning your honeymoon, anniversary or just trying to get away for sun and relaxation, you need to be assured of excellent accommodations and price. We want you to return and to recommend us to your family and friends so you will find the unit clean, well maintained and with all the amenities to make you feel right at home! **If your dates are not available for this unit, please email or call me for a referral! ** We also have units 717 and 815 at the Mahana, vrbo #'s 195801 and 195811 available! Ben & Evie Leland live on island, retired and enjoy giving back to their community. They are proud owners of 3 condos at The Mahana. They were both in construction for over 30 years, have 5 children and 13 grandchildren. One of their daughters, Alicia, is their booking agent while Ben manages the properties. Alicia (with Visit Maui Beach) lives in Seattle Washington and has 5 children. We love our small family run business, our properties are amazing, very well kept and we offer over the top customer service. Our unit 114 is not only gorgeous, it is literally steps from the beach! The owner is on island and very close by in case you should need anything or the unit should need attending too. We offer fabulous customer service and love what we do! The Mahana is really a hidden oasis, you will so happy here! salt, pepper, some spices, foil, zip lock baggies, etc. This condo was just as expected. We were transferring from another hotel on island and Alicia was kind enough to let us check in a bit early so our food didn't spoil. The unit was clean and well stocked. I rent a lot of VRBO and Air B&B's and this unit was by far the most well stocked unit I have ever stayed in. There were spices in the cupboards as well as ziplock bags and tin foil, etc. for cooking. It was well stocked with paper towels and toilet paper as well. The kitchen was nice and open so you could enjoy the ocean view while cooking meals. The master bedroom was spacious and the bed was very comfortable. You could hear the crashing ocean waves that just lulled you to sleep. We will definitely plan on staying here again when we are back in Maui! We love staying at the Mahana. This was our second trip to the exact same spot, same floor, almost same room. We love the first floor location hear as you walk right out the door and onto the grass, then the beach. The facilities are clean, pool area is fun and the hot tub is always 103. It is easy to self checkin at any time and the owners/operators are very quick to reply to any questions. 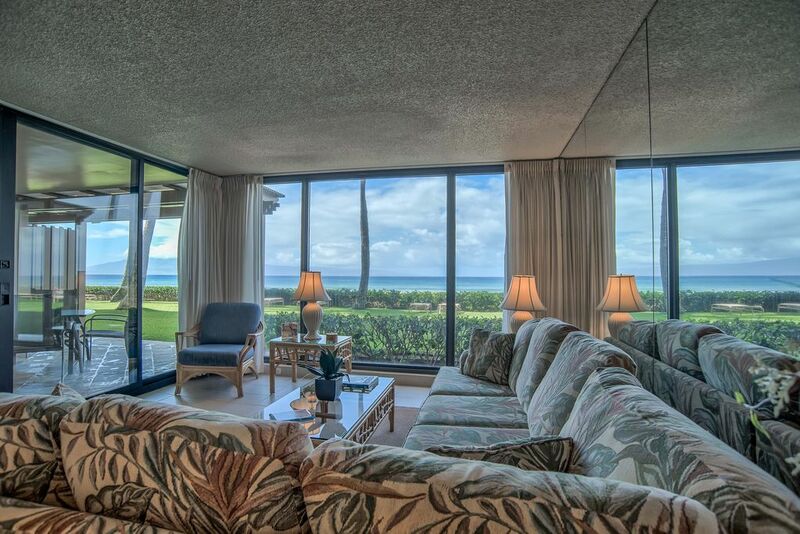 Every morning and evening was spent on the lanai sipping drinks and watching the whales breach. We highly recommend staying at the Mahana. We had a amazing time at your condo. We saw whales every morning with a few turtles going by too. We were lucky enough to talk to the next door owners ,who gave us a few tips on where to eat. The view was spectacular. The condo was very clean and comfortable we would recommend staying here in a heartbeat. Alicia was extremely attentive and communicated extensively with us from start to finish. We love the condo and the location. I would recomend it to anyone wanting to stay in Kaanapali. Great location. What a fabulous place to stay and enjoy all the pleasures of Maui! It didn't matter if you left the room to go explore the Island or stayed in this beautiful luxury condo, paradise was at hand. This condo was the perfect space, comfortable sleeping space, all the kitchen supplies you need to feel at home. The entire resort, all of the amenities and the sensational views made us feel like we were in heaven! All good things to say about this place. Everything went smoothly and trouble free. The room was super clean and fully furnished. Great location and great property. We will be back :) Thank you!